New facility will include a shopping-style food pantry. 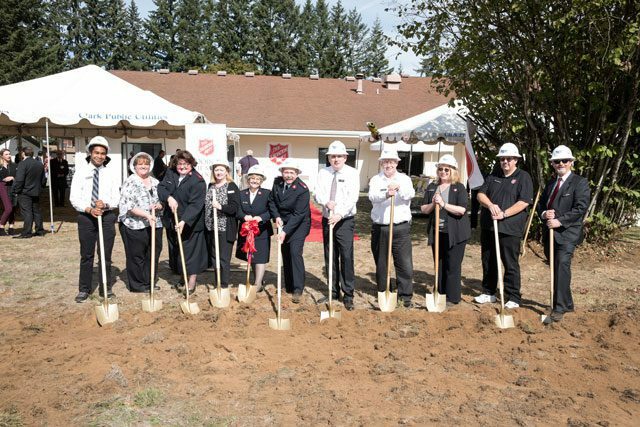 On the day of the Vancouver (Washington) Corps groundbreaking ceremony, Congresswoman Jaime Herrera Beutler stood at the podium, recounting her time with The Salvation Army after 9/11. Speaking to an audience of board and community members, she explained how the experience exemplified the persistence and passion of the Army—something that still holds true today. A few feet from the podium sat Vancouver Corps Officers Majors Michael and Susan Nute, proof the persistence and passion Beutler described remains alive and well in their community. The Vancouver Corps Oct. 3 groundbreaking marked the beginning of a 9,000-square-foot expansion of the corps’ campus, something the Nutes have envisioned since they were appointed to Vancouver nearly seven years ago. Located near the border of Washington and Oregon, the Vancouver Corps has long been a solid part of the community. Since its establishment in 1890, it has served Clark County through food programs, case management, job training, eviction prevention, utility assistance, after-school care, back-to-school preparedness and toys for children during the holidays. They assisted more than 16,000 people in 2017. Keeping in mind the Army’s promise to “Do the Most Good,” the Nutes knew they needed to grow even further. A key feature of the expansion will be a shopping-style food pantry where patrons can select their own food as they would in a grocery store. Children will be able to play in a designated area while their parents shop for the week. Since the majority of people coming to the corps for services utilize the pantry, this new design shows that the officers are attuned to the community’s needs. The shopping-style pantry is one element of an expansion planned as a comprehensive upgrade. The scope of the project ensures all services currently provided will move closer to meeting their full potential. Other upgrades include a computer lab to aid in job research, new case management offices to help maintain client privacy, a designated space for clothing giveaway, a teaching kitchen to further nutrition education and a larger space for the SAY Klub after-school programs. The $5.7 million project, set to begin in November, would not have been possible without the support of others. Large entities like the State of Washington, City of Vancouver and Clark County gave significant amounts, as did many individuals who stand behind the Army’s mission to serve those in need. The corps is still working to meet its financial goal. Nute is optimistic; he knows the community will come together to support this milestone for Vancouver. “We cannot rest until the vision to expand is a reality and the facility for bigger and better services is in place,” he said.